Helen Cordero of the Cochiti Pueblo is known as the first person to make a storyteller doll. 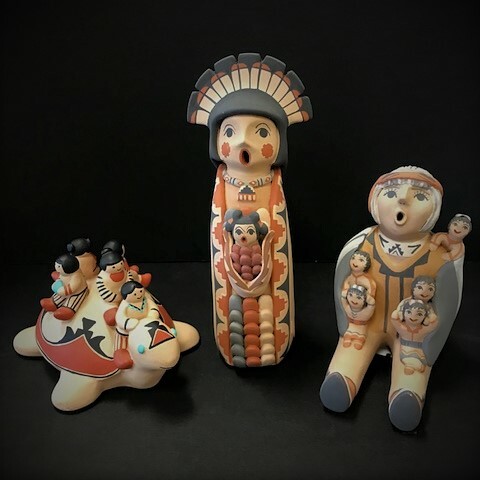 The people of the Cochiti Pueblo in New Mexico, situated between the Rio Grande River and the Jemez Mountains, have been making distinctive pottery featuring black designs over the top of layers and layers of white clay slip for over one thousand years. Traditionally the potters of Cochiti made useful items such as pots, bowls, and other containers. They also made small figures of animals and people. Some of these figures were decorative. Others were used for ceremonies. One of the most common was a mother holding a child. These mother-child figures were known as “singing mothers” because their mouths were always left open to let the lullaby out. In 1964, drawing on the “singing mother” motif, Helen created a clay figure based upon her grandfather Santiago Quintana. Mr. Quintana was a renowned pueblo storyteller. What she most remembered about is seeing him with lots and lots of grandchildren, like herself, climbing on him, begging him for stories, a request that he almost never refused. He told stories of Coyote, Rabbit, and Badger, the little people of the American desert. He told stories of Corncob Boy and Corn Mother, mythic beings. He told tales of times past, and of people in the pueblo. He never ran out of stories, she remembered, because he could makeup stories that were as good as the old ones. The figure she made was unlike any before made in the pueblo. It was a grandfather with children climbing onto his lap. She added children climbing up the storytellers braids, peeking over his head, sliding down his arms. The storyteller was large compared to the children, as if to suggest the size of his influence. However, Helen Cordero never referred to her little figures as children. She called them “little listeners”. She believed that what they were doing was as important as what the storyteller was saying. Wisdom, she believed, came into the world, not because it was spoken, but because it was heard. Echoing the older singing mother figures, Helen Cordero left the mouth of her storyteller open to let the stories out. She left the eyes closed. Her storyteller was always thinking of the next thing in the story. Since those early storytellers back in 1964, the art form has blossomed in all directions. No longer are the eyes always closed and the central figure does not have to be a grandfather. Mothers, grandmothers and animals all can be the storyteller. Turtles especially were thought to be a special friend of pueblo children. It was said that long ago when neighboring pueblos were at war, Turtle came and took the children away. He hid them and kept them safe. In another story, turtle takes dreaming children on a journey to see the whole world, but only if they promise to keep their eyes open. They must see the beauty, or they will be dull people all their lives.